The Real Deal South Florida’s fall magazine is set to hit newsstands this September! The issue is packed with the most important industry news and insider information, including a ranking of the top brokerages in the tri-county region and a look at the priciest condo sales of this cycle. We survey the biggest multifamily investment deals of the last 12 months and look at the trends taking over environmentally-conscious building in that market, while also checking in on what’s happening with the area’s retail brokers. We’re also putting spotlights on two areas in flux, profiling Little Havana’s evolution and western Broward County’s increasing commercial might. 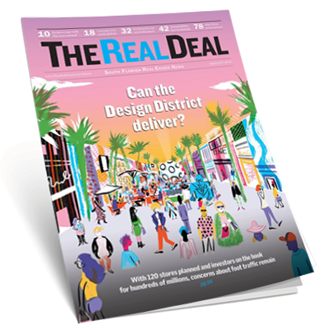 Through TRD’s new partnership with the Miami Association of Realtors, the new issue will distributed directly to its 25,000 members as well as to all attendees at our real estate showcase and forum in October. You can receive your copy by subscribing to The Real Deal South Florida. Click here to read the summer issue. Email Advertising@TheRealDeal.com to learn more about advertising opportunities.